The cyprus tree is an evergreen tree that botanists also classify as a shrub, depending on its height. Cyprus trees are excellent trees for windbreaks and as ornamentals for landscaping purposes. Those native to this country come in a variety of shapes. Another tree with cypress in its name—the baldcypress—is related to the redwoods and giant sequoias. Many people simply refer to it as a cypress, despite it being in a different tree family. It gets its name from the fact that its leaves, which are much like needles, fall off every year. Realize that all members of the cypress family native to the United States exist in the West. The Monterey cypress grows only in the Monterey bay area of the California coast while the Macnab, Tecate and Gowen cypresses are also coastal species. The Arizona cypress grows in southeastern parts of California and throughout much of Arizona. Notice the different shades of green that the American cypress species possess. The Monterey cypress has bluish-green foliage, as does the Tecate cypress. The foliage of the Gowen cypress is a dark green hue while the Macnab cypress is a lighter shade. Examine the foliage of a cypress tree. You will observe that it resembles scales and has an intricate pattern of overlapping pairs on the stem. The foliage almost appears braided on or that someone meticulously glued it on the twigs of the cypress tree. The cypress species develop woody cones that are less than 1.5 inches across, which contain the seeds of the tree. Observe the shape and size of a cypress tree. The Monterey cypress has a flat crown that resembles an open umbrella and can grow to 70 feet high. The Arizona cypress is cone shaped like a Christmas tree, and those in the open spaces may reach 60 feet. The Gowen cypress is a many-stemmed tree or small shrub that rarely gets taller than 25 feet. Note the great size of the baldcypress. It is the largest tree that grows east of the Rocky Mountains, with some specimens attaining 150 feet in height with trunk diameters of 6 feet. Remember that baldcypress trees exist in the coastal plains from Delaware along the Atlantic Coast to Florida and then west to Texas in the Gulf Coast states. 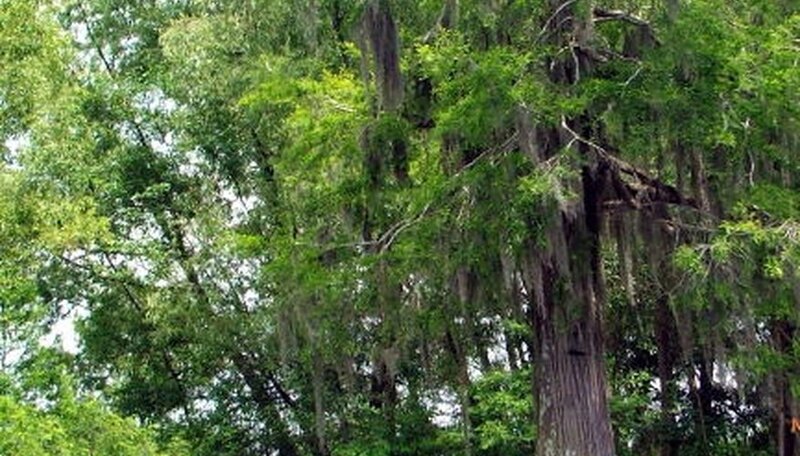 Baldcypress also grows in the Mississippi Valley region. The tree grows in or near water, with entire swamps often full of the tree. Check around a baldcypress for what resembles “knees” coming out of the water around the tree. These protrusions are part of the root system and they will grow out of the water in the immediate vicinity of the tree. The baldcypress will also have Spanish moss hanging from it in many instances.